Categories provide the ability to be selective about what to include on pages and feeds that are auto-populated with content. Dropdown menus can also be provided for website visitors to filter content by category. Category functionality is available on all of the special page types. Every site contains a categories block at the base level. Categories are added to the block in four specific groups; two that are custom topics for your site, two that are related to your courses (Degrees and Concentrations). General CMU categories are also provided (not shown in categories block). 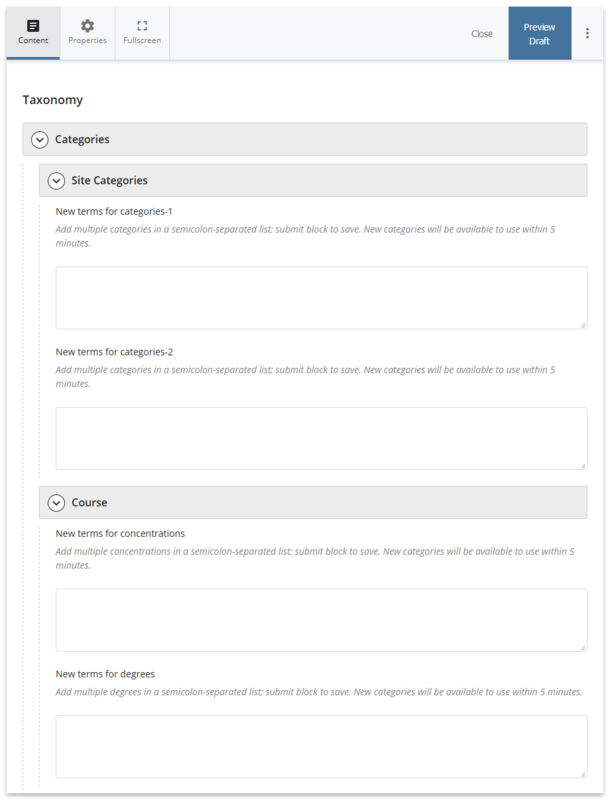 Special page types (Bio, News Article, Course) are tagged with select categories; choose from the categories added to the categories block, or from a list of general CMU categories commonly used across the university's websites. Special index page types (Bio Index, News Index, Course Index) and RSS feeds can have a filter applied to only include pages tagged with select categories. Dropdown menus can be added to special index page types (Bio Index, News Index, Course Index) for category filtering by website visitors. Dropdown filtering is done on the fly, so the page doesn't have to reload! Follow the step-by-step instructions below to set up categories and use them on your special page types. After categories have been added to Categories-1 and Categories-2, you will have the option to specify a custom Dropdown Label. These labels will display on the special index page types if the dropdown is added. If not specified, Category 1 and Category 2 will be used as the labels respectively. Examples of custom dropdown labels: Areas of Expertise, Topics, Field of Study. Categories block edit interface; fields are available to add new terms to four groups of categories. When creating or editing a Bio, News Article, or Course page, there will be a section for selecting Page Categories. When creating or editing a Bio Index, News Index, Course Index page or RSS feed, there will be a section for Filters; filters can be applied so that only pages tagged with specific categories are displayed. Filters in the page edit interface. When creating or editing a Bio Index, News Index, or Course Index page, there will be a section for Dropdowns. Dropdown menus allow category filtering by website visitors, such as filtering by a course number or a professor's name. Review the special index page types to ensure filtering and dropdowns function as expected; publish relevant pages when ready. 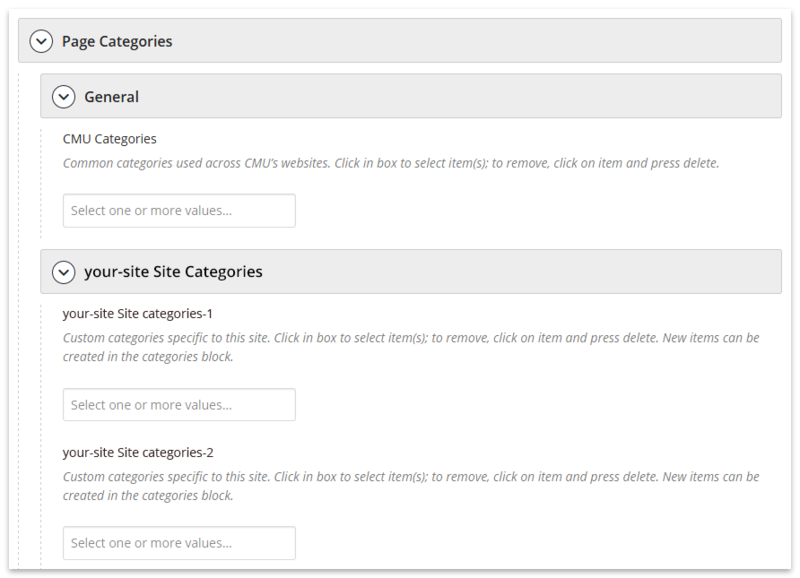 General CMU Categories are pre-defined categories available to all sites, however only the ones tagged on your pages will be listed in the dropdown. The dropdown label can be customized on a per-page basis. Do I need to have filters applied in order to use the dropdowns? No, dropdowns can be used regardless if a filter has been applied. If a dropdown is enabled but no pages have been tagged with its respective categories, the dropdown will not display. Do I need to add categories to the categories block to use filtering and dropdown functionality? No, you can use the general CMU Categories for filtering and dropdowns if the categories are sufficient; the categories block is for specifying custom categories not available in the general CMU Categories. I don&apos;t have the custom dropdown label fields in my site&apos;s categories block. In order for the custom dropdown label fields to appear for Categories 1 & 2, you have to submit the categories block with terms in these fields first, then edit the categories block again; the custom dropdown label fields should then be available. I&apos;m not seeing all of my categories listed in the dropdowns. The CMS is smart enough to not include a category in a dropdown if no pages are tagged with it. Once a category is used on a page, it will then be listed in the dropdown. In addition, be sure that all relevant pages are published when using categories (see next topic). What do I need to publish when I use categories? How do I delete categories from my site? 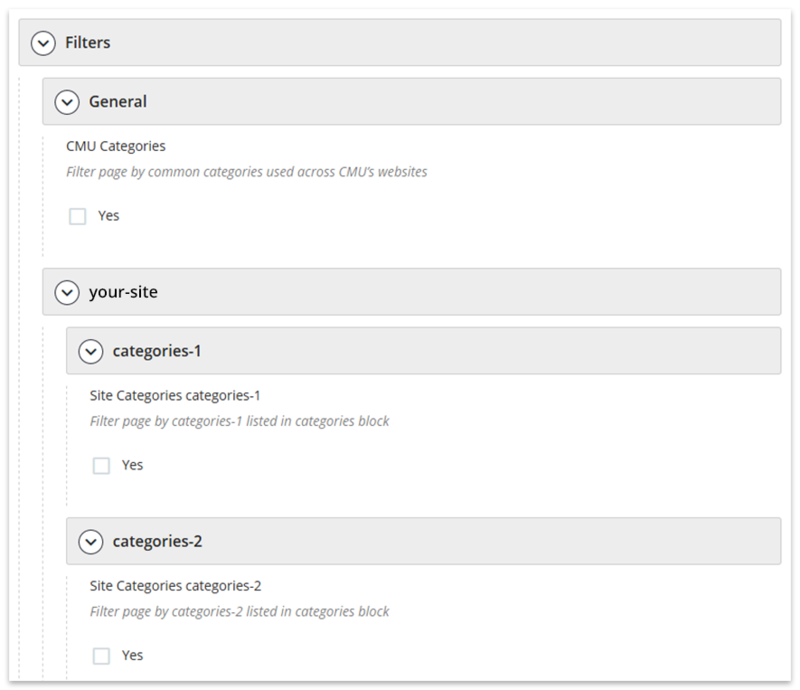 Unfortunately you won't be able to delete categories from the categories block, however the CMS team can do this for you. Submit a request to it-help@cmu.edu.